Here & Now | A Denver Style Blog: orange and...? Do you still have one favorite color? I love orange with dark blue or navy, as well as burgundy. The color is great on you! oh... these heals are amazing! :) So tall! Love this jacket too! very chic heels and coat!! love the color!! Ooh great advice lady - I think orange + cream sounds dreamy... I'll have to give it a try! I wear all sorts of colours! Love the brown and orange, the belt looks great. Oooh so cute! I love this! I love that trench! I think orange and navy blue go well together. I don't know if I have a go to color pairing, but some of my favorite colors to wear are purple, blues/turquoise, and gray. I also love accenting with red in sweaters and scarves. Recently I've been wearing more cream as well - it goes with everything! These colors are great. And I would probably fall in those shoes, but I would sure as hell give them a good try. I've told you before that you are absolutely gorgeous, correct? You are. I think orange and blue are great together, or maybe even orange and mustard? My go-to color pairing seems to be purple and green! Awww, give orange and brown a chance! ;) It can be really pretty! Oooh I like the way you think! Yes, leopard IS a color, and I think it would be great with orange too! Love this orange with these great shoes! I love this orange on you! You look fab! I don't really have a color that I go to a lot...except for black...but that's a bit morbid so I probably shouldn't say that out loud. Brown and orange go great together. My all time favorite color is pink. Which I own a lot of it. So cute! 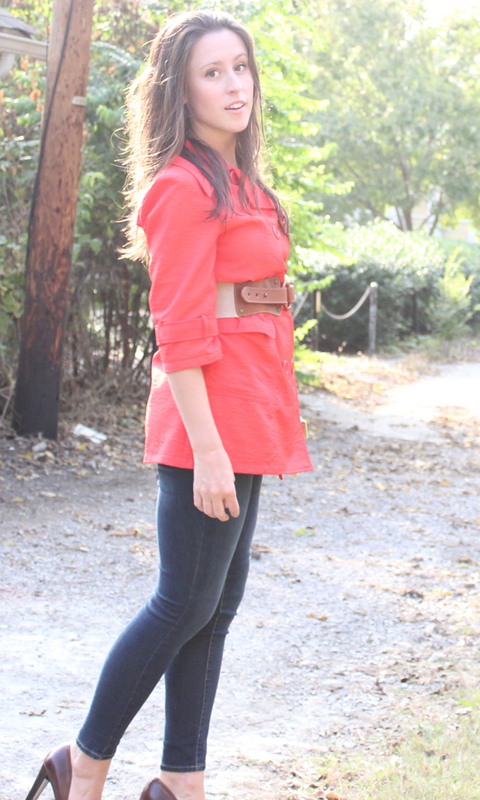 I love the belted shirt with those heels. Great look! Great outfit! Love the orange trench with your skinny jeans. I don't like mixing black and brown or blue and brown. Weird? I know. As for you orange I would think brown would be okay. Also nudes would be good. Even, pastels. I don't have very many oranges but I usually just wear it with tan. I think I am with you with orange and black. Cute but make everyone think of Halloween. Hi gorgeous girl!! 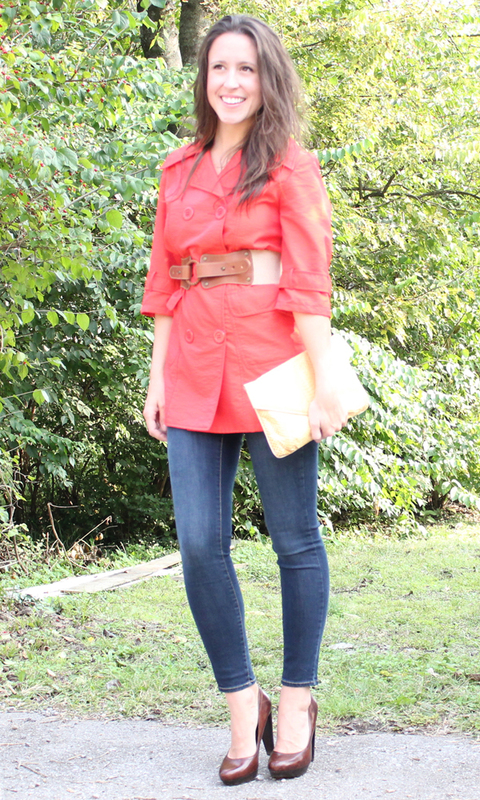 I absolutely LOVE what you paired that fabulous orange trench with! I'm SO happy you stopped by my blog because now I found you! Following you now via Bloglovin and GFC! Excited to see more inspiration darling! Cute outfit! I'm really loving orange with blue these days. Love those jeans, too! Now these are some nice skinnies! The belt looks adorable like this! 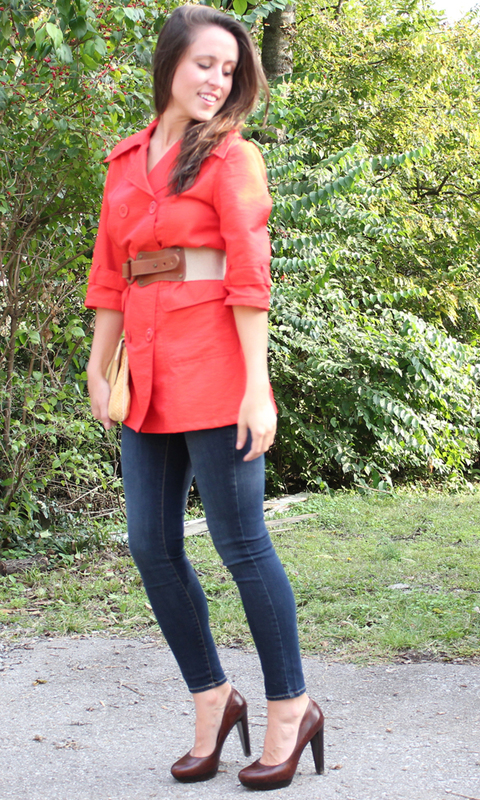 LOVE that orange trench - such a cute look! Love this jacker and that big belt! Hot pink, teal, and navy blue are all great with orange!!! AND, if you are really daring, it can look amazing with red (a bluey red). I love this outfit especially the trench coat!!! So cute! I was going to suggest navy or any tan/neutrals. I think the burgundy suggestion is a good one too! And why not continue to pair it with your fave other blue hues & just darken up the accessories for a more Fall-appropriate look. I know you can do it girl! okay that jacket is amazing!! my fave color is pink, but lately i've been branching out in the color world! purple and blue have become quick favorites. Cute look! Loving that jacket!